The Future Of Rikers: Solar Panels, Not People? 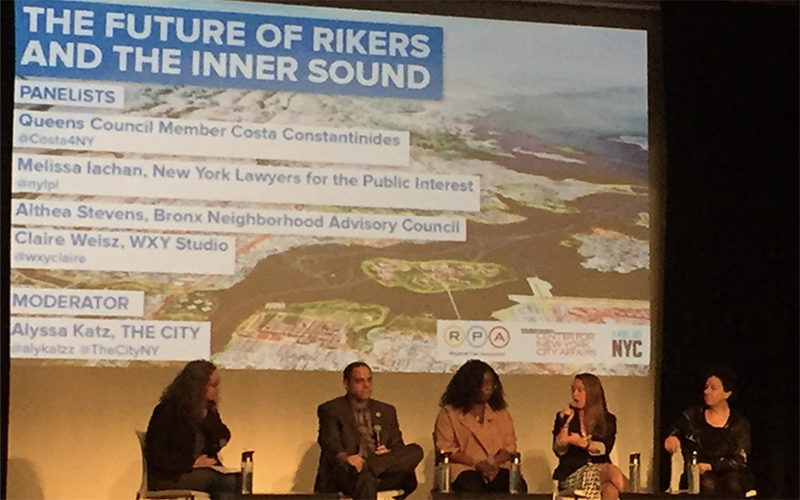 Melissa Iachan, our senior attorney for environmental justice, held forth on a Regional Plan Association panel on Friday about the future of Rikers island. “We’re talking about not only shifting the environmental burdens from communities who, for far too long, have taken the entire city’s burden on themselves, and depriving them of the opportunity to have access to waterfronts they have never even seen, they don’t even know that there’s a river right there, but also, actually meeting the city’s zero waste goals,” she said. The future of Rikers has been attracting more interest recently, in particular with this in-depth story at The Marshall Project, focusing on how to close the jail and reduce prison populations across the city. The panel included discussing possibilities for the future of the island, how to close the jail without burdening other communities in New York, what kind of process would be optimal, and what role city council could play in the process. Melissa Iachan, an attorney with the New York Lawyers for Public Interest, stressed that the city is struggling to find adequate space to process organic waste as it works to reduce greenhouse gas emissions and divert waste from landfills, and that the creation of a digester “can sort of take care of all these problems at once” by dramatically increasing the city’s organics waste processing power while creating renewable energy. A new marine transfer station could also be built that would allow waste to be barged to the island instead of sending fleets of gas-guzzling trucks through communities. “In this vision we could really capture a lot of the city’s organic waste, keep it from being trucked into our communities of color, and instead have it be railed and barged directly for beneficial use,” said Iachan.